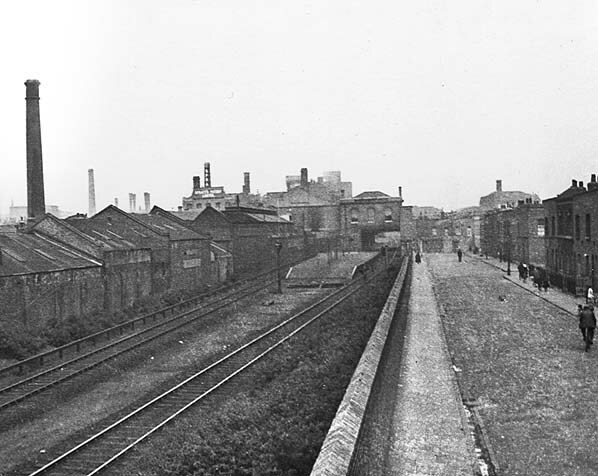 Location: A footbridge linking Fawe Street and Clutton Street passes over the site of the station. Present state: Demolished. The Docklands Light Railway now runs through the site, although nothing remains of the station the footbridge which once spanned the North London Line is still in use. Spratt's Patent pet food factory which was built in 1899 and stood on the west side of South Bromley station has now been converted into luxury apartments. Notes: South Bromley was the last station to be opened on the Poplar line, opening on 1st September 1884. It had a single island platform accessed from a footbridge. 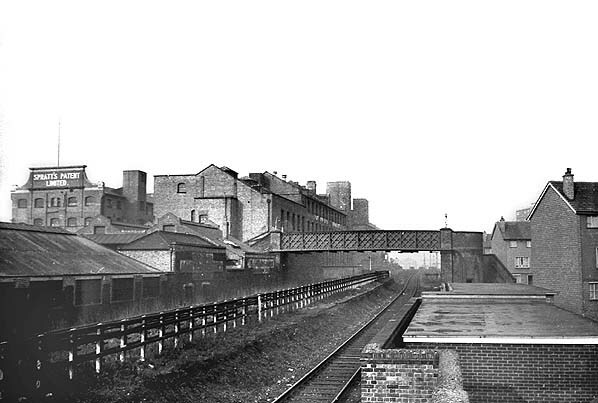 The station building was above the track at the north end of the station. 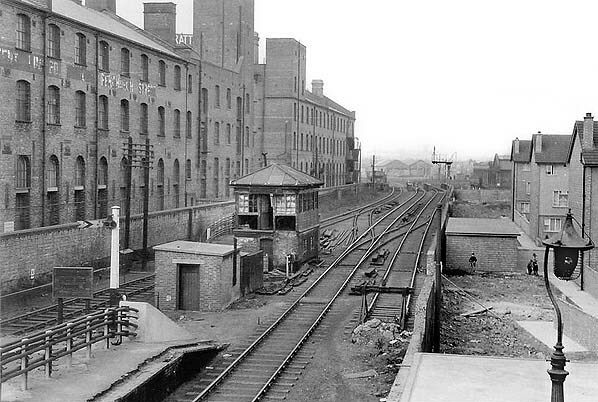 There was a signalbox to the north of the station. When the North London Line service was suspended due to enemy action on 15th May 1944 the station remained open selling tickets for the emergency replacement bus service but one month later was damaged beyond repair when a V1 'flying bomb' landed to the west of the cutting. The bus service was withdrawn on 23rd April 1945. 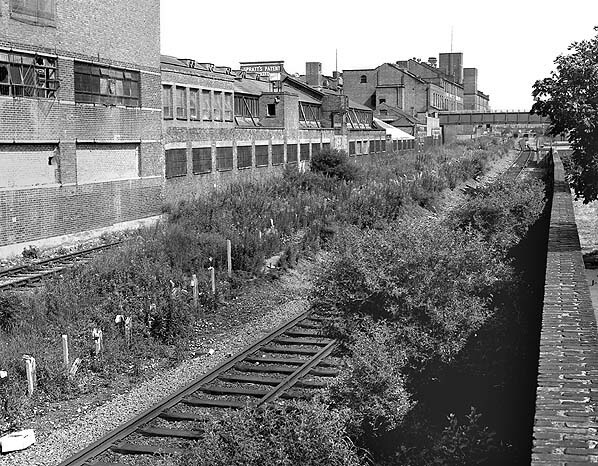 The station buildings were quickly demolished after closure but the degraded and overgrown platform remained until 1985 when the Docklands Light Railway was built. The footbridge spanning the north end of the station is still in use. 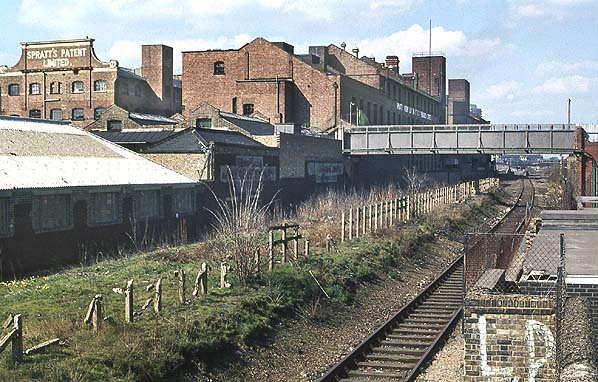 Devons Road loco shed which supplied the majority of the locomotives for the North London line was sited just south of South Bromley Station was demolished in 1983. The site is now an industrial estate. Freight traffic was now also in decline as the developing motorway network made it more economical to transport freight by road. 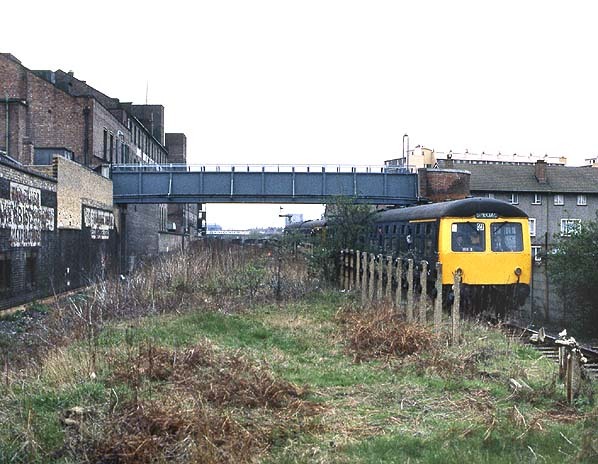 By the early 1980's the Poplar line had been reduced to the status of a long siding and freight traffic ceased from 3rd October 1983. On the 5th May 1984. The points at Victoria Park Junction were removed and the track south of Victoria Park was lifted shortly afterwards. The remainder of the line between Dalston and Victoria Park fared better. During the early 1970's there was a spirited campaign to reopen the line between Dalston and Stratford but nothing happened until the spring of 1979 when British Rail announced plans to reinstate the 'Missing Link' and introduce an hourly service between Camden Town and North Woolwich. Progress was quick with the line reopening for passenger traffic on 14th May 1979. Intermediate stations were later opened at Hackney Central (12.5.1980) Dalston Kingsland (16.5.1983), Homerton (13.5.1985) all on or close to the sites of the earlier stations. the station. With the opening of a new connecting spur between the North London and the former Great Eastern line at Hackney the remaining Broad Street trains were diverted into Liverpool Street bringing final closure to Broad Street and Dalston Junction on 30th June 1986. By the early 1990's the Watford Junction to Liverpool Street was reduced to just four trains Monday - Friday. This service was withdrawn in September 1992 with the closure of Primrose Hill station. The site of South Bromley Station looking south in March 2009. 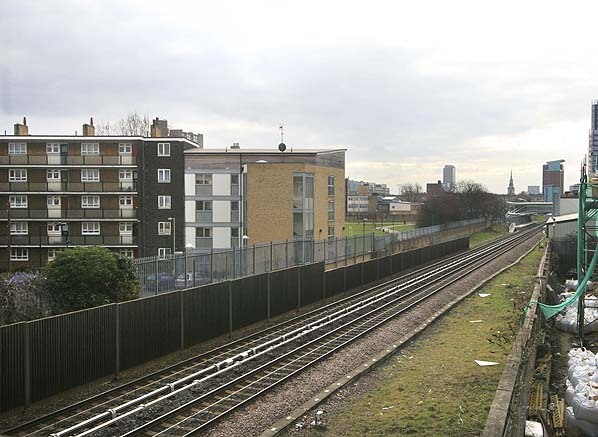 The DLR's Langdon Park Station which opened in December 2007 can be seen in the distance.